Do not throw out that old dictionary. Or, if you must, make sure that you have access to a place that keeps old books. The law is written in words. Often disputes arise over the meaning of words in contracts or statutes or constitutions. Recently, the United States District Court for the District of Maryland had such a case. See District of Columbia v. Trump, ___ F. Supp. 3d ___, 2018 WL 3559027 (D. Md. 2018). [N]o person holding any Office of Profit of trust under them (the United States], shall, without the Consent of the Congress, accept any present, Emolument, Office, or Title, of any kind whatever, from any King, Prince, or foreign State. U.S. Const. art. II, § 1, cl. 7 (emphasis added). Judge Peter J. Messitte denied the President’s motion to dismiss the case for failure to state a claim. Among the factors that Judge Messitte considered was the original public meaning of the word “emolument” at the time that the Constitution was written in 1787. Judge Messitte relied heavily upon a working paper by Professor John Mikhail of Georgetown University Law Center. See John Mikhail, The Definition of “Emolument” in English Language and Legal Dictionaries, 1523-1806 (June 30, 2017). Professor Mikhail’s paper piqued my curiosity. For almost 15 years (14 years and 9 months to be exact) I was President of the Baltimore Bar Library; Jim Astrachan currently is a member of the Bar Library Board. I spent many hours in the Bar Library back in the day when very little legal content was available online. Today, very little legal content is not available online, including some ancient legal texts that have been scanned by Google. The Bar Library was founded in 1840 and was one of the leading law libraries in the United States well into the 20th Century. I wondered how many of Professor’s Mikhail’s ten legal dictionary sources were resting on the shelves of the Bar Library. 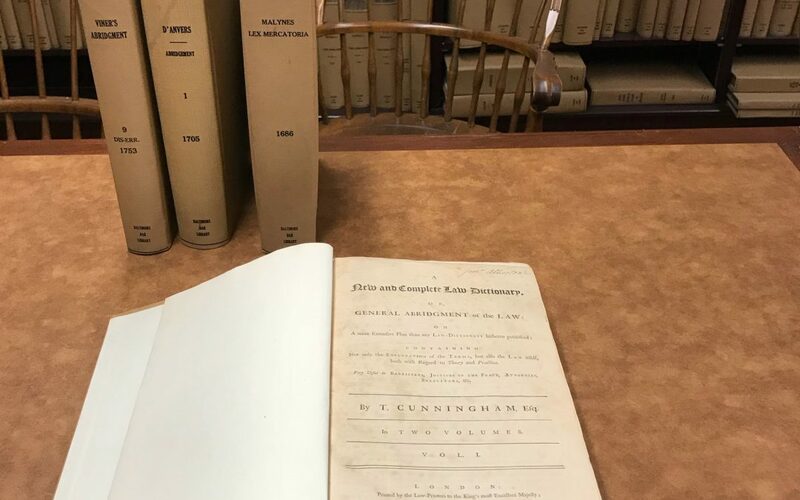 With the assistance of Joe Bennett, the Librarian of the Bar Library, and Barbara Karpel, the Assistant Librarian, I was able to locate in the Bar Library the exact editions of two of the legal dictionaries. I was able to locate two other legal dictionaries by authors cited by Professor Mikhail that were later editions, Finally, I was able to locate at the Bar Library one legal dictionary within the timeframe of Professor Mikhail’s article that he did not cite and two others that were just beyond his timeframe (i.e., 1809 and 1829). The Baltimore Bar Library is a pack rat’s delight. About 20 years ago when I was President of the Bar Library, the head of another law library visited. Her advice to me was: “Pull up a dumpster and start throwing out stuff.” Maybe no one has looked at the Bar Library’s 17th and 18th Century legal dictionaries in decades. But, we are fortunate to have such a treasure trove of information just a few blocks from our office.